Lee and Kathy Randall established a $30,000 endowment for AICPA collection support. OXFORD, Miss. – Lee Randall loves the University of Mississippi. He earned a bachelor’s degree in accountancy from Ole Miss in 1971 and after retiring from Entergy as vice president and general auditor, Randall wanted to give back to his alma mater. 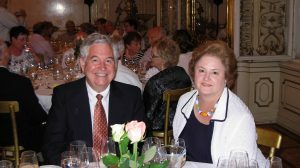 Randall and his wife, Kathy, of New Orleans, have created the Lee and Kathy Randall AICPA Collection Support Endowment for the J.D. Williams Library in the amount of $30,000. The National Library of the Accounting Profession at UM houses more than 200,000 accounting items. Included in this impressive count is the huge library of the American Institute of Certified Public Accountants, the national organization for practicing accountants. This constitutes the largest collection of accounting materials in the world. “Lee and Kathy Randall’s generous gift will allow the library to increase our digitizing efforts with the AICPA collection,” said Cecilia Botero, UM dean of libraries. “Once digitized, the library makes these resources freely available through the library homepage. The AICPA donated its century-old collection of books, pamphlets, manuscripts and periodicals to the university in two installments, one in 2001 and the last in 2014. These materials document the social, political and regulatory history of a profession critical to the development of the modern world economy. The accounting standards set by the AICPA have governed how wealth in the American economy is defined and reported. Such an important responsibility has involved the country’s accountants, business leaders and politicians in long and contentious debates, and many of these discussions are archived in the Ole Miss Accounting Library collection. The gift from the Randalls will help fund the hiring of a graduate assistant to preserve parts of the collection and support ongoing maintenance of the collection, which is viewed by students and researchers more than 100,000 times each year. “We are grateful to Lee and Kathy for their generous gift to enhance the AICPA Library,” said Mark Wilder, dean and KMPG Chair of Accountancy. “Through the support of the Randalls, the AICPA Library holdings will be more readily accessible by practitioners, researchers and students throughout the region, nation and world. By agreement with the AICPA, Royce Kurtz, associate professor and AICPA research and instruction librarian, is digitizing and making freely available older AICPA publications on the internet. Other items he is digitizing include the Accounting Historians Journal of the Academy of Accounting Historians, an enormous historical collection published by agreement with the accounting firm Deloitte, and a large collection of items that are old enough to be out of copyright. The library’s full-text digital accounting collections contain 400,000 pages from some 8,000 books, pamphlets, and journal articles. Working accountants, scholars and students from around the world access the library’s digitized accounting materials online more than 90,000 times a year. Ole Miss doctoral students in accounting regularly use the collection for their research, as do accounting scholars around the world. Their research has been published in some of the top journals in accounting. This service to international scholars is one of the most important benefits of the collection for the university, helping bolster its status as a Carnegie R-1 institution, identifying Ole Miss as a university of highest research activity. Having this collection at Ole Miss helps the accountancy school maintain its reputation and ranking as one of the nation’s top schools, Randall said. “I hope our donation will allow students and researchers to better utilize this collection and that it will be there for many years to come,” he said.